He was back on the road for an 11 day road trip to make Warrior Wishes come true in 10 different cities. 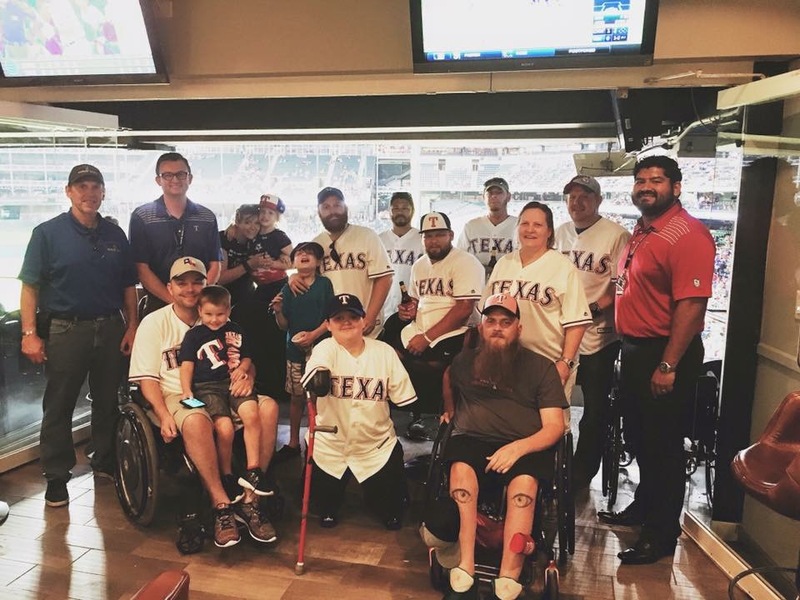 This is the 3rd leg of the Battlefields to Ballfields Tour – hosting and honoring wounded vets and fallen hero families at all 30 baseball stadiums. 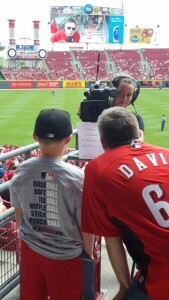 So far this Baseball season we have hosted heroes in Atlanta, Boston, Detroit, Kansas City, St. Louis, Houston & Dallas. Over the next week and a half, my dad will be making warrior wishes come true in Cincinnati, Detroit, Pittsburgh, New York, Boston, Back to New York again, Washington DC, Baltimore, Philadelphia & Cleveland. 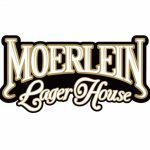 Our newest Board Member, Bill Heaton, pickes up my dad around 3:00 AM to get to Cincy in time for brunch, thanks to Moreleins Lager House. They arrived a few minutes late, but thanks to Andy at Moreleins, Marine Larry Draughn Jr, his wife Katylin and 2 kids , along with Melissa Sluss -Tiller and her 9 year old daughter were seated and ordered before they arrived . We had a great brunch while getting acquainted. My dad slipped up & spolied a surprise when he told the waitress we were going on the field before the game. Needless to say, they were still excited for the opportunity! 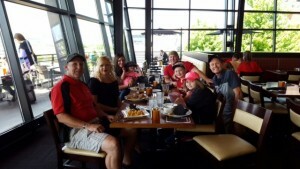 My dad also set all the New Era Reds caps on the table at lunch and let everyone pick one to wear at the game. 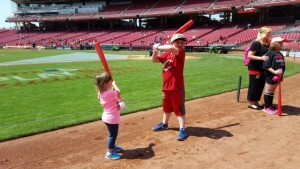 With new caps and full stomachs, everyone walked across the street to “Gappers Alley” at The Great American Ballpark to get escorted on to the field – it was wiffle ball bat day, so the kids got their bats, we headed past the locker room, down the tunnel and onto the field. 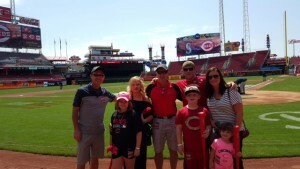 The families felt very special cuz they were the only ones on the field other than staff and players. 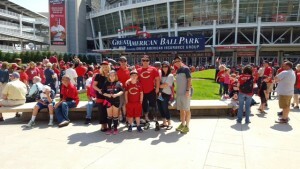 We can’t thank the Reds enough for their incredible hospitality from Phylicia (who set it up) to Donovan (who was our guide). It was an incredible experience! After snapping a few pictures from the field, The Warriors & their families made their way up to their seats. 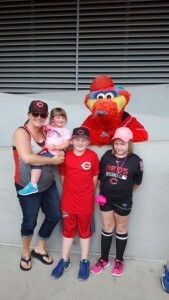 The Reds brought Gift Bags to them, and probably the most exciting thing for the kids was having the opportunity to announce the lead-off batter on the Jumbotron!!! 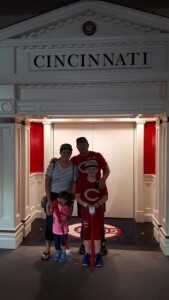 In the words of both families, “this was a great day ” We couldn’t have made it all possible without the Cincinnati Reds who provided a once in a lifetime experience at the game, Moerleins Lager House who provided brunch, New Era Cap who outfitted everyone with new Reds caps. 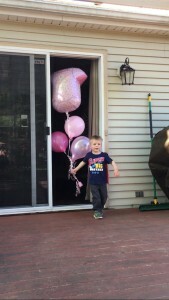 & Bill for providing transportation and helping us Make these Warrior Wishes come true! Thank You All! Most importantly, Thank You to the Draughn and Sluss-Tiller families for their service and sacrifices to our country! Never unnoticed, never forgotten. Bill and my Dad will be heading north overnight and plan on being in Detroit tomorrow afternoon to make Warrior Wishes come true in Detroit. Stay tuned for more details! 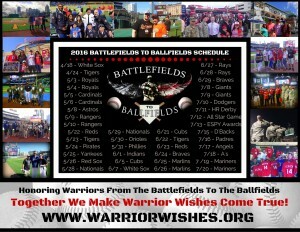 Dont forget to nominate your hero for an upcoming game on our Battlefields to Ballfields mission! Sgt. 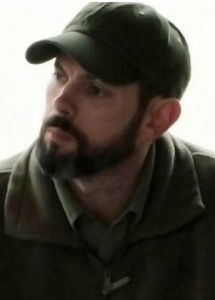 1st Class Matthew S. Sluss-Tiller was born on Feb. 14, 1974, in Ashland, Ky. He graduated from Lawrence County High School in 1993. He died of wounds suffered from an improvised explosive device in the Lower Dir District of Pakistan’s Northwest Frontier Province, Feb. 3, while deployed in support of Operation Enduring Freedom. He enlisted in the United States Army Reserves as a heavy construction mechanic in 1991 and served at the 261st Ordnance Company located at Cross Lanes, W.Va. In 1993, he enlisted in the U. S. Army as a signal specialist and served at Fort Bragg N.C., Kitzingin, Germany, and Kuwait. He was assigned to the 96th Civil Affairs Battalion (Airborne), 95th Civil Affairs Brigade (Airborne) at Fort Bragg, N.C., in April 2009 and has served as a civil affairs noncommissioned officer in Civil Military Operations Cell and most recently as team sergeant of Civil Affairs Team 622. During his career, he deployed to Afghanistan in support of Operation Enduring Freedom, Iraq in support of Operation Iraqi Freedom, and Operation Joint Guardian, Kosovo. His military education includes the U.S. Army Airborne Course, U.S. Army Jumpmaster Course and Master Jumpmaster Course, Air Movement Operations Course, Military Transition Team Course, Civil Affairs Qualification Course, and the Advanced and Basic Noncommissioned Officer courses. His awards and decorations include the Bronze Star Medal, Purple Heart Medal, two Meritorious Service Medals, five Army Commendation Medals, Joint Service Achievement Medal, five Army Achievement Medals, five Good Conduct Medals, two National Defense Service Medals, Kosovo Campaign Medal, Afghanistan Campaign Medal, Iraq Campaign Medal, Global War on Terrorism Service Medal, Humanitarian Service medal, NATO Medal, Combat Action Badge, Senior Parachutist’s Badge, Gold Recruiter’s Badge, Drivers Badge as well as German Jump wings. He is survived by his wife, Melissa, and daughter Hannah of Sanford, N.C., his mother and stepfather Jane and Forest Blankenship of Sanford, N.C., father and stepmother Edward and Von Tiller of Sevierville, Tenn., and stepsister Selena Dawn Pack. 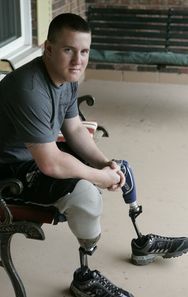 Marine Corporal Larry Draughn was on his second deployment in May 2009 with the 2nd Battalion, 3rd Marines, Golf Company, when an improvised explosive device (IED) blast in Helmand Province, Afghanistan caused the traumatic amputations of both of his legs as well as the amputations of two fingers on his right hand. Cpl Larry Draughn was on a routine foot patrol of the area around his company’s base camp when an IED exploded under his feet. While cautiously stepping into the footprints of the forward team to ensure there were no bombs in the area, his weight transferred from one footprint to the next, detonating an IED that was buried underneath the barren poppy field he was patrolling. Thrown through the air by the force of the blast, life-saving measures were administered as tourniquets were applied to both of his legs. Hand-carried by stretcher for more than half an hour to be evacuated, Cpl Draughn was transferred to a waiting Blackhawk helicopter that flew him to Bagram. It was there, over the next few days, that he learned of his amputations and his journey home began. Airlifted to Landstuhl, Germany, Cpl Draughn was next sent to Bethesda Naval Hospital before arriving at Walter Reed Army Medical Center where he received daily therapy sessions. A native of Dayton, Ohio, Larry is an avid fisherman. He enjoys deep sea and bass fishing and also enjoys fishing in local Paralyzed Veterans of America tournaments. He likes to hunt and is a baseball fan as well. As he looks toward a career in the future, Larry hopes to one day find employment with the National Security Agency (NSA) where he can apply many of the skills he learned as Marine. Globe Life Makes Warrior Wishes Come True in Texas!